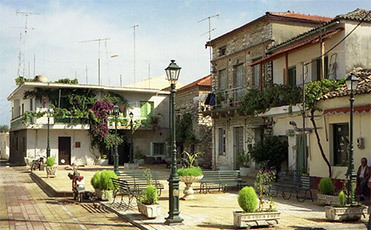 With its 5000 inhabitants Lefkimmi is one of the biggest villages on Corfu island. This village has not been developed for the tourism and still today keeps its old structure and traditions. People who live here are original from Corfu, like the persons who live in smaller villages like Argyrades, Sinarades and Ag. Matheos. The first impression can not be so positive as the buildings here are old and not very well maintained comparing to the other tourist villages. The place anyhow is really charming and is still linked to old tradition; you’ll see old woman with donkeys, people drinking Ouzo in local bars and a marvelous surrounding country side. In Lefkimni there’s also a small river that crosses the town and that is used by local fishermen. Not far from the village there’s the local lighthouse and the traditional village of Potami. Lefkimmi is not on the sea and hasn't a proper beach. The nearest beaches are Molou bay, just two kilometres far (click the arrow to see the photo) and Alikes bay. Lefkimmi is connected with Corfu town many times per day by the local bus service. 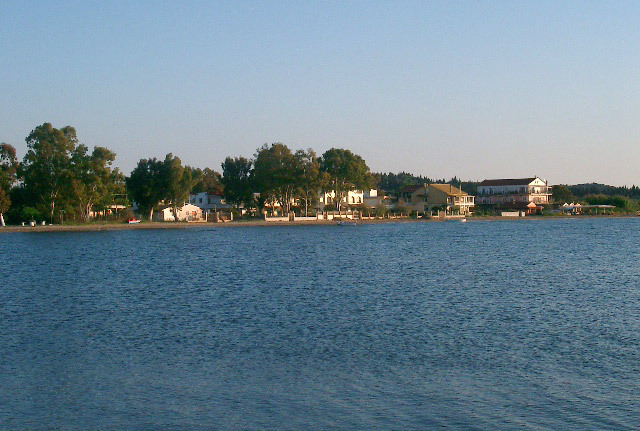 Lefkimmi's new port is south of Potami and Melikia and today it is used by ferry-boats that connect Corfu with Igoumenitsa and Paxi island. In Lefkimmi there are some snack bas and market shops used mainly by local people. This is a very calm and relaxing place. It’s ideal to try a dinner in a traditional Greek restaurant however here you will not find any kind of night life. In Lefkimmi is difficult to find an accommodation. This village is big but not tourist developed.